Some of the best new films remind us to slow down and enjoy and appreciate the important things. This is a common response to The New World, and to any film that does not offer the conventional narrative focus on what happens next. After all, many moviegoers go to the cinema to “turn off” their brains and be entertained, not to interpret visual poetry, exercise their intellects, or contemplate mysteries. We’re accustomed to being served a chain of rapid and surprising events, spectacles so fast and frenzied that we don’t have a moment to appreciate subtlety and ponder possibilities. But for those with a hunger for more substantial and nourishing fare, there are plenty of alternatives to the summer blockbusters, both in theatres and on DVD. Art can offer us more than narrative — it can give us unique experiences. And some experiences require us to steer off the fast track and take a meandering route. Just as we can’t enjoy the rejuvenating effects of a two-week wilderness camping trip by taking a lunch break in a city park, so we cannot absorb the experience of The New World without surrendering ourselves to its 132 minutes of Edenic scenery and half-whispered prayers. There are two films playing in theatres right now that offer us both the razzle-dazzle of entertainment and the intriguing questions of art. And they’re as different from The New World as they are from each other. One is a low-budget, improvisational comedy from one of the greatest living directors. The other is a computer-animated adventure from Walt Disney Studios. 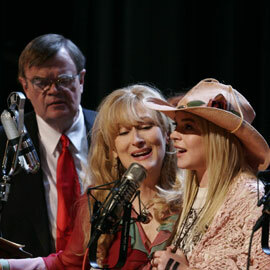 Big musical numbers, poignant storytelling, and lowbrow humor — Garrison Keillor’s A Prairie Home Companion has been a dependably entertaining radio show since 1974, faithfully celebrating American music, history, and community with such fervor that it has won enthusiastic, loyal audiences from coast to coast. for capturing inspired improvisation from a cast of seasoned actors. The film pretends that A Prairie Home Companion is a long-running stage show based in the Fitzgerald Theater in Saint Paul, Minnesota. And, borrowing a boilerplate plotline from old Walt Disney movies, Keillor's script sets up a straw-man villain — a heartless businessman (Tommy Lee Jones) –– who has bought the theatre and plans to demolish it. He shows up to stare coldly down on the people whose lives he's about to overturn. Meanwhile, the show must go on. And the audience applauds appreciatively while we progress through onstage comedy, nostalgic folk songs, and amusing anecdotes. We’re taken backstage to encounter Keillor’s characters in their quieter moments. Keillor strolls through the chaos with a cool head, striking a precarious balance between professionalism and a dangerous nonchalance. He’s followed around by an extremely pregnant stage manager (Maya Rudolph), who tries to keep him from forgetting his stage cues. The manager has help from Guy Noir (Kevin Kline), a somber, thoughtful security man and a fumbling oaf — one part Bogart, one part Clouseau. Elsewhere in the hubbub, a singing-sisters duo, Yolanda and Wanda Johnson (Meryl Streep and Lily Tomlin), reminisce with wild abandon in front of their glorious makeup mirrors. Slumped in a corner chair, Yolanda’s daughter Lola (Lindsay Lohan) writes suicide poems and pouts until her big-stage debut. Also performing, the musical cowboy duo Dusty and Lefty (John C. Reilly and Woody Harrelson) offer a musical tribute to bad jokes, bringing down the house and boiling the temper of the show manager. Floating around the edges of things, a character known only as “Dangerous Woman” has come with an agenda. She’s the film’s riskiest bit of whimsy, and more than a little bit ridiculous, but Madsen’s presence is another of the film’s simple pleasures. And that’s the whole point: Sometimes, when we settle for flashy, hollow distractions, we miss out on the rewards of humble but meaningful experiences. In the movie, A Prairie Home Companion is a ghost of a program, a run-down production in an overlooked cul-de-sac off of the fast lane, a delightful melody being drowned out by the noise of shows driven by personality and ego. But it has deep roots and a whole lot of heart. There’s something contradictory about Altman’s approach to Keillor’s world. He has packed so many familiar big-screen faces into the film that it becomes a sort of all-star show, which runs somewhat counter to the production’s tradition of celebrating art rather than celebrity. I found myself wishing that there was a little less Hollywood and little more focus on American music, with guests like Gillian Welch and David Rawlings, or Alison Krauss, instead of this parade of Hollywood regulars. And yet, the musical performances are not shallow pop or sanitized entertainment. They're rough, risqué, and infused with gospel. It’s the gospel numbers that provide the film’s holiest moments, reaffirming that people who are drawn to the best things in life cannot help but end up on Christ’s front porch …even if they aren’t bold enough to knock on his front door. Such enthusiasm is well-deserved — Pixar has consistently delivered the most astonishing digitally animated feature films, from Toy Story to Finding Nemo, leaving their competition in the dust. But the secret to their success has a lot more to do with storytelling than animation. Each film has been built on the foundation of a memorable, moving narrative that speaks to viewers of all ages. Their latest is no exception. While Cars isn’t as powerful as Finding Nemo, it creates just as dazzling a world, giving us a screen-full of chatty automobiles without any human beings in sight. We may not see any people, but this story of a four-wheeled fellow named Lightning McQueen has been designed to appeal to our longings for a slower pace, meaningful relationships, and a home that gives us a sense of belonging. McQueen (voiced by Owen Wilson) is a race car with ego and ambition who, on his way to try and win a big race called the Piston Cup, crashes off Route 66 into the forgotten town of Radiator Springs. After smashing up a lot of property there, he’s convicted for the damage he’s done and assigned to community service. He’ll have to repair a torn-up road before he can hurry off to his race. Slowly but surely, McQueen will get to know the locals, learn there’s more to life than celebrity and winning, and find love along paths less traveled. These nostalgic automobiles, given voices by stars like Paul Newman, Bonnie Hunt, and Michael Keaton, wax rhapsodic about the days before the Interstate, when people had to drive ALONG long and winding roads that surrendered to fluctuations in the landscape. Those cars got to know the country, wandered into one-of-a-kind small towns, and discovered unexpected wonders along the way. Now, in our fast-paced, no-time-for-sightseeing culture, we think we’re better off getting exactly what we want as quickly as possible. Thus, we're losing relationships, joys, a sense of proportion, and a necessary reverence for the land. Directed by John Lasseter, and dedicated to Pixar storyteller Joe Ranft (who died in a terrible car accident last year), Cars is the most predictable of Pixar’s films. But that’s a minor quibble. By slowing down and taking the time to remind us of the joys we miss when we prioritize speed and convenience, it becomes a must-see. 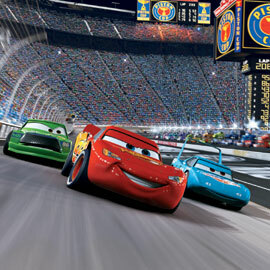 Even die-hard NASCAR fans will find themselves breathless with awe when McQueen takes an unexpected turn into Pixar’s vision of the Grand Canyon — technicolor rock formations radiating beauty as far as his headlights can see. How odd, Pixar’s talking vehicles appeal more powerfully to our shared human longings than any movie about men and woman released so far this summer. To read past columns in Response OnScreen, click here. A student-led campaign called “reVISION” brings an outpouring of support for those with AIDS. Four professors with 121 combined years of commitment to the University say goodbye to SPU and hello to retirement. Young alum Bryce Phillips has built successful businesses while advocating work-life balance for himself and his employees. Falcon decathlete Chris Randolph became a two-time national champion while setting new SPU records. A Class of 2006 graduate reflects on lessons learned in Havana, Cuba, and in a classroom visit from Edward Nixon — Richard Nixon’s brother. As Professor of Art Michael Caldwell retires, he shares a landscape from the Big Sky Country.